Built in 1847 to aid to ships navigating dangerous reefs off the lower Keys, the Key West Lighthouse now stands sentinel over one of Florida's finest historical sites. The tower was originally 46 feet high and powered by 15 oil lamps with 15-inch reflectors, but was extended to 86 feet in 1894. Inside visitors now climb 88 iron steps to the observation deck that affords spectacular views. The tower and nearby Keeper's Quarters have been faithfully restored and maintained as they were before the lighthouse was deactivated in 1969. Many of the historic elements remain, including the pipes used to deliver acetylene gas that powered the light before it was electrified in 1927. The clapboard bungalow where the keepers and their families lived while maintaining the beacon has been recreated in turn-of-the-century style with historic furniture, furnishings and photos that provide a sense of life in Key West during that formative time. This light station was built after the hurricane of 1846 destroyed the original tower on the coast. It is the 15th oldest surviving lighthouse in the country. But as intriguing as the structures themselves are the lives of the keepers who climbed the steps each day to clean and fuel the lamps, especially that of Barbara Mabrity, who took over after her husband died in 1832. 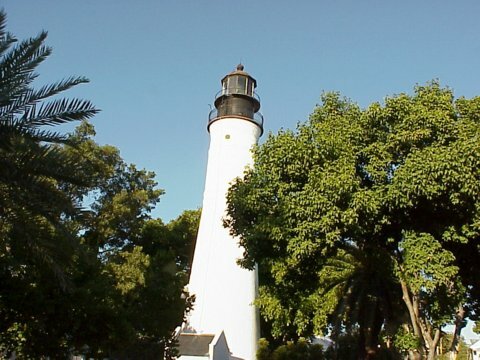 She tended the lamps for the 32 years until at age 82 she was fired for making statements against the Union, which controlled Key West and the lighthouse during the Civil War. When a hurricane destroyed the light station in 1846, Barbara Mabrity survived but six of her children were killed after the family sought shelter in the tower. In 1886 the original keeper's dwelling was torn down and replaced with the present building. After its deactivation, the Lighthouse was acquired by Monroe County. In 1972 it was leased to the Key West Art & Historical Society, which added safety features and opened it to the public in 1989. The keeper's quarters were renovated in 1990 and opened as a museum. In 1998 the lighthouse was nominated for inclusion on the National Register of Historic Places as a National Historic Landmark, which would put it in the same category as the Washington Monument and the Lincoln Memorial in Washington, DC. open every day except Christmas from 9:30 a.m. to 4:30 p.m. Admission is $10 for adults, $5 for children (children under 6 Free) and students with ID, $9 for Seniors (62+), AAA Travelers and Locals with ID. Members - Free. Follow Route 1 into the center of Key West. Where Route 1 takes a right and Route A1A comes in from the left you will see the lighthouse right in front of you. Go straight at the light onto Truman St. and turn right into the Key West Lighthouse Museum parking lot.